Research has already proven that prolonged use of the regular the mouse can cause Carpel Tunnel Syndrome due to the fact that one has to twist the arm and wrist in an abnormal position. For this reason, inventors have been trying to come up with better mice designs and Jack Lo was among the first inventors to come up with a new type of mouse. In 1994, he created the first mouse that supported the hand in a handshake position, which would not need pressure or hand twisting. The Evoluent VerticalMouse is what Lo called his invention and years later, it is in its fourth generation, which is what we will look into. So is it the best vertical mouse? Continue reading this review to see my opinion. This mouse can actually be said to look peculiar because it is 3” tall and does not even look like a mouse. However, it is that height that allows a person to use it in a vertical handshake position without any wrist pain. The quality is excellent even though made of plastic since it has been pieced together using other different materials. The body is made of mat black rubberized finish that allows the user to grip the mouse without any pressure on their wrists or fingers. On the left side is a thumb well made of two- toned silver components while the front and buttons are finished with purple plastic. Overall, the mouse is as lightweight as it is durable. The design helps with the ergonomic aspects of using the mouse and allows you to work all day with little fatigue. This is one of the most accurate mice in the market and can easily be used for gaming, browsing and Photoshop. Even though you can use it straight from the box, you can download the Mouse Manager Software from the Evoluent website for customization. You can interchange the button functionalities to your liking so you can use it with much ease. The Evoluent Mouse has a variety of different models for both right and left-handers. There are versions made for smaller hands and one can choose to have a wireless or wired mouse. The wireless versions come with USB receivers or are Bluetooth enabled while the wired version comes with a 75” long cable. It also comes in many different colors. The Evoluent Vertical Mouse might be different from what you are used to but with all these features, it is definitely worth having. I believe it is the best ergonomic mouse out there. 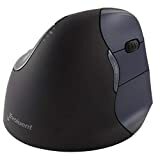 This mouse is recommended mostly to people who use computers everyday due to health issues but anybody can use and enjoy it. You can also read more about the benefits of a vertical mouse here. If you have any question, comments or your own personal experiences with the Evoluent Verticalmouse please feel free to leave a comment below. I like it, cool looking mouse tool with ergonomic benefits. I actually had a wrist injury through too much mouse use. The Doctor gave me a 30 day sick note, not that it helped as I am self employed. The point being that something like this product can actually make a difference as you are working. Thanks for the comment and that is too funny that you are self employed and your doctor gave you a 30 day sick note. This would help as well as a ergonomic keyboard. Just some ideas to give a try. Let me know how it goes. Wow, this is such a cool product. Ever since I started working on my blog, I have spent a tremendous amount of time in front of the PC and feeling the strain on my eyes, neck, shoulder and recently, my right wrist. I thought it was an old injury developed at my work place, but after watching the video, it all makes sense that the pain is coming from using the mouse for too long. I also like the fact that they have something for the left handed people (that’s me). Slightly pricier but I think it’s worth the investment! Thanks for the comment and your personal experience. Yes it is a little pricey, but it is also well worth it to all of us that work long hours in front of our computers. It really will let you work more comfortably and be more productive in the long run. I have an old wrist injury that flares up after prolonged sitting and typing. I now alternate my mouse hand from right to left(and vice versa) when I start to feel discomfort in my forearm and wrist. This is a pretty cool product, especially since it would put your wrist in a neutral position where you are not putting pressure on your ulnar nerve. I should have invested in one of these instead!